I'll try to keep the spoilers to the minimum, so please excuse the fairly short review. I can't say much in fear of spoiling the entire book! I adore this book so much! I've always loved fantasy, but mixing in mystery with it just makes the plot even better! 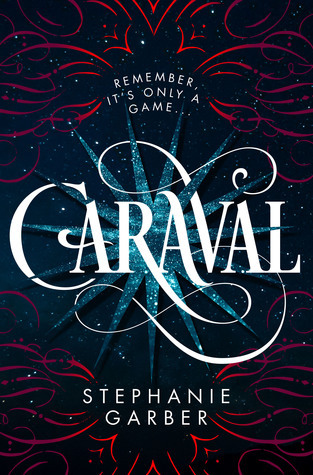 Caraval is mind-blowing. It has all the elements of a nice fantasy novel, but the mystery is woven in with the plot so well. There were times in the book where I had no clue what was going on. I can't even count the amount of plot twists in this book, each one making the plot so much more intriguing and addictive. It's only a game, we are reminded throughout the book, but how much of it is real? I love how the lines between make-believe and reality are blurred beyond measure. My favourite character is Tella, although her being a recurring character in the book, she was unpredictable - unlike Scarlett. I thought Scarlett was not too different from an average YA protagonist: feisty, protective of family, etc. etc. but that didn't matter too much. Tella however, showed her manipulative character at times and also sly intelligence. Julian was more complex, mainly because of all the secrets surrounding him, but I do like him as a character. I hope to find out more about his past and relationships. Do I ship Julian and Scarlett? I think that their relationship is complicated, especially since it was built on lies and deceit, but they do have the potential to be a cute couple. Despite the fact that I don't like hastily done romances for the sake of romance in YA novels, I think Caraval wouldn't have worked without their love for each other. Well, actually, their love is still at the early baby stages, but there's always room for development, right? I can't wait to read the next book! The cliffhanger at the end?! ARGH so many mysteries are still left unresolved! I hope that the next book is equally as intriguing as this one. I've been seeing this book everywhere, and I keep thinking that it sounds so great! Your review is pushing that feeling! I mean who doesn't love a good magical mystery? I remember you telling me about how much you enjoyed reading this book! You don't get many books that mix fantasy mystery very well, so I'm definitely going to be picking this on up soon!